The California Association of Realtors recently released its Housing Affordability Index (HAI) for the 1st quarter of 2018, which measures the percentage of households that can afford to buy the median priced single family dwelling (house). If the HAI Index incorporates changes to the federal tax code (effective 1/1/18) limiting the deductibility of interest expenses and property taxes, it will presumably have a negative effect on affordability percentages in 2018. However, as of Q1 2018, the CAR Index has not yet been able to adjust their calculations for these changes. Since the real significance of many of these charts is in the longer term trends, we’ve only updated some of the charts below in this report with Q1 2018 data: Q1 median home prices, income required to purchase a median priced house, PITI costs, and county affordability percentages. Having dropped approximately 40% from 2007 to mid-2016, extremely low interest rates have subsidized increasing home prices to a large degree in recent years – but they’ve begun to rise significantly in 2018. San Francisco is still above its all-time affordability low of 8%, last reached in Q3 2007 (even though its median house price has increased more than 50% during that period). Other Bay Area counties (except for Silicon Valley) have appreciably higher affordability percentages, for the time being. Generally speaking, as one moves farther away from the heart of the high-tech boom, San Francisco and Silicon Valley, affordability increases. As seen in the chart below, so far in 2018, SF luxury home sales have been very strong, higher than in any previous year since the recovery began in 2012. The recent stock market volatility notwithstanding, the economic confidence that has been sweeping the nation is also showing up in our luxury home markets. For example, as of February 16th, the sales of condos, co-ops and TICs at prices of $2m and above has jumped 55% in the city, year over year, and luxury houses by 19%. Note that year-to-date data is very preliminary and much more will be known once the spring selling season really gets started in earnest. Also, if the recent financial market volatility continues and becomes even more dramatic, that may cool high-end home markets (and IPO activity) as it has in the past. Longer-term sales volume charts – which also show a substantial bounce in sales in calendar year 2017 – are a bit further down in this report in the “Overview: Listing & Sales Volume” sections. However behind the positive sales statistics, inventory statistics provide a note of caution, especially for what we call the ultra-luxury home segments: houses selling for $5m+ and condos and co-ops selling for $3m+. In those segments, the supply of listings has been surging well beyond demand, and many of these listings are expiring without selling. As an example, ultra-luxury home sales make up about 2.5% of total sales, but as of February 23rd, they made up 12% of active SF home listings (no offer accepted). It appears some sellers are getting a bit over-exuberant regarding the value of their beautiful homes. This is illustrated in the 2 charts below. Just because a luxury market segment is notated as being in buyer-advantage market territory does not mean that some listings do not sell very quickly for well over asking price, as some certainly do. Ultimately in real estate, it all depends on the specific property, and its appeal, preparation, marketing and pricing. 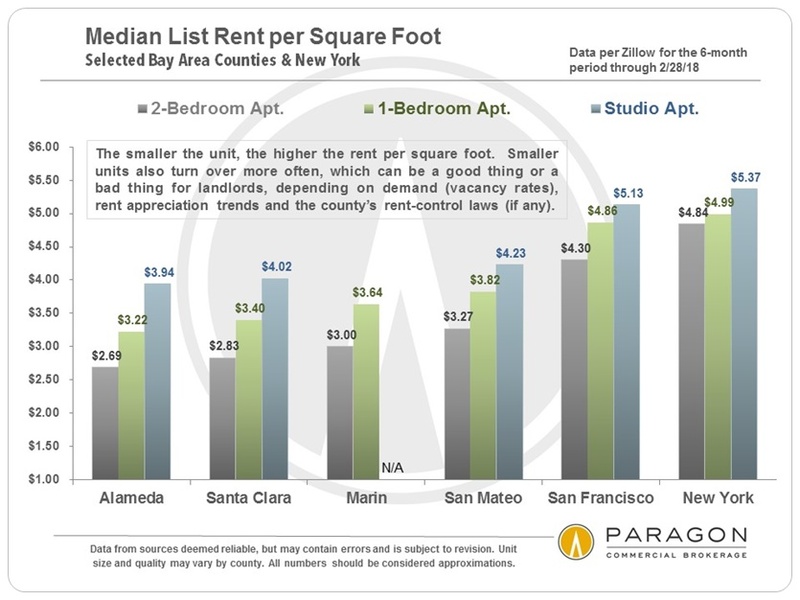 It can be challenging to measure appreciation in the most expensive price segments, because, firstly, there are not that many sales, and secondly, because of the huge range of sales prices with those segments ($3m to $30m for luxury houses in SF; $2m to $22m for condos and co-ops), but it may well be that their values have generally plateaued since 2015, or in some instances, ticked down a little. But it all depends on the property, and different neighborhoods are often experiencing very different market conditions in the city, some much stronger than others – especially in the luxury homes segments. How the 2018 market plays out depends on a number of factors that are susceptible to change: financial markets, interest rates, the course of the high-tech boom, whether our big, local start-ups proceed with IPOs, political developments, and so on. . (Positive & Negative Factors in Bay Area Markets) For the time being, the San Francisco market appears to be off to a heated start characterized by robust demand. Here at Paragon, our 2018 SF sales volume in January and February was up 38% year over year, though admittedly we are outperforming the general market, which is up about 8%. Most analyses below are based on 6-month or 12-month rolling figures as those typically provide a better illustration of the general direction of market trends (using larger data sets), as opposed to common monthly fluctuations (based on very small data sets). Each data point is these cases reflects the average or median statistic for the 6 or 12 month period. The charts above illustrate overall listing and sales volume trends for 1) in the top 2 charts, the entire luxury home market, and then, 2) in the bottom 2 charts, specifically for the more costly ultra-luxury segment. There are some significant differences between the luxury condo and house markets, but, generally speaking, luxury home sales soared since the recovery began in 2012, cooled a bit in late 2015 (financial market volatility, as well as jump in new-luxury-condo construction), and then bounced back in late 2016 and 2017. The inventory of active listings on the market has risen considerably in the past 2 years, which has appreciably altered supply and demand dynamics. As a point of comparison, in the more affordable home segments (especially for houses), supply has not risen, and indeed has declined in some areas, and inventory is still very inadequate when compared to the heated demand. Further down in this report, we deconstruct the luxury markets further by property type, price segment (expensive vs. very expensive) and by neighborhood, and that is where some interesting and sometimes dramatically diverging trends come to light. In this analysis, charts will sometimes use different price thresholds for the luxury designation, depending on when the chart was first created, or whether different property types are being mixed together. Right now, we consider that luxury condos, co-ops & TICs start at about $2m, and luxury houses at $3m – that is roughly the top 10% of their markets. What we call ultra-luxury adds another $1m to condo sales prices, and another $2m to houses, and constitutes about the top 2.5%. prior to 1940. More than half were built before 1920.
were condos built since 2000, many of which were newly built. These analyses were made in good faith with data from sources deemed reliable, but may contain errors and are subject to revision. It is not our intent to convince you of a particular position, but to attempt to provide straightforward data and analysis, so you can make your own informed decisions. Median and average statistics are enormous generalities: There are hundreds of different markets in San Francisco and the Bay Area, each with its own unique dynamics. Median prices and average dollar per square foot values can be and often are affected by other factors besides changes in fair market value. Before discussing neighborhood values, appreciation rates and market cycles, here are 3 overview charts on the entire city market. 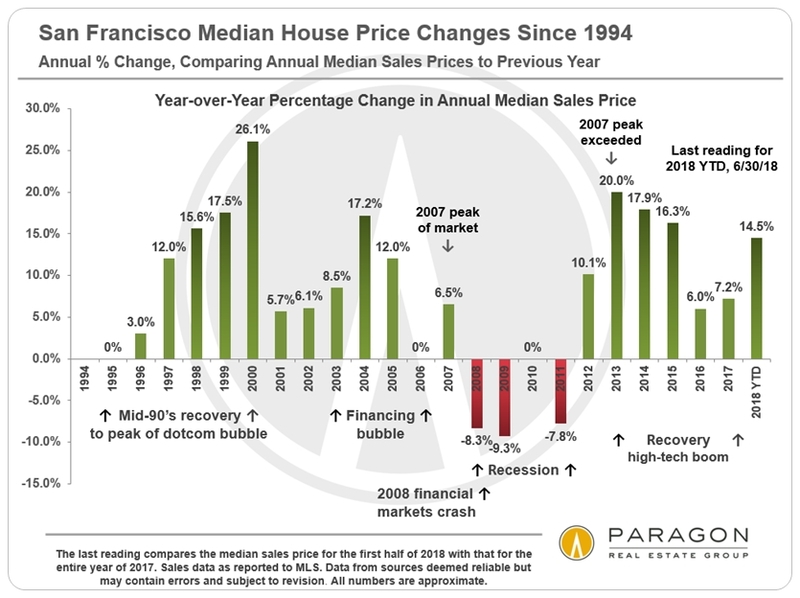 On a 3-month-rolling basis, median home sales prices in San Francisco yet again hit new highs in April 2018: The median house sales price jumped $55,000 over the March price to hit $1,665,000, and the median condo sales price jumped $50,000 in April to $1,225,000 (3-month rolling sales through 4/30/18, reported by May 2). Those reflect year-over-year increases of 23% and 8% respectively. Average dollar per square foot values also reached new peak values. The neighborhoods and districts circled on the map below have seen compound annual appreciation rates of 12% or more over the past 6 years. As a point of comparison, the national rate over that period was about 7%, and the CPI inflation rate about 1.5%. As illustrated in the table below the map, the highest rate in San Francisco over the period was above 18%. If the return on cash investment was calculated for purchasing with a 20% down payment (instead of paying all cash), and adjusting for closing costs (estimated at 2% on buy-side, 7% on sell side), the compound annual rate of return on the cash investment soars: A 10% annual rate of home price appreciation would then translate into an annual compound return on cash investment of just under 40%. The use of financing in home ownership is one of the reasons why it can often be such a good investment to develop household wealth over time. median house sales price by the 2011 price. Though median home price appreciation rates throughout the city have been incredibly high by any reasonable measure, some neighborhoods have outpaced the norm. The main reason is affordability: Less expensive homes have appreciated considerably faster than more expensive homes. Also, some of the most affordable districts were hammered by foreclosure sales after the 2008 crash, which brought their sales prices down to unnatural lows by 2011 – setting the stage for dramatic recoveries. Bayview, with the most affordable houses in SF and also worst hit by the 2008-2011 distressed property crisis, has had the highest compound annual appreciation rate since that time, a staggering 18.3%, or a 6-year total rate of 174%. Other affordable neighborhoods running across the southern border of the city – such as Excelsior, Visitacion Valley, Sunnyside, Ingleside and Oceanview – also saw extremely high annual rates of 12% to 14% for similar reasons. The dynamic in the Inner Mission was somewhat different: Its 14.7% compound annual rate of appreciation – a total of 128% over the 6 years – was because it turned into the hottest, hippest district in the city, especially among younger high-tech workers. The gentrification which had been slowly occurring for 30 years suddenly went into overdrive to catapult prices higher. Bernal Heights – with a 13.3% compound annual rate and 111% 6-year total – is right next to the Mission on one side and to Noe Valley on another. It was perfectly situated to take advantage of the classic overflow effect for people who wanted a similar neighborhood ambiance to Noe or Eureka Valley, but could no longer afford their much higher prices. Outer Richmond was also a standout: It has the lowest house prices in the northern third of the city. And the Sunset & Parkside district is filled with mid-price 2 and 3 bedroom houses, has a variety of attractive neighborhood commercial districts, ocean or parks on 3 sides, and easy access to highways south to the peninsula. All these factors have made it into a much sought-after location to purchase a home in recent years. The market there is insanely hot now. The most expensive neighborhoods in the city have lower, but still very high rates of appreciation. And in dollar terms, their appreciation returns are by far the highest in the city. 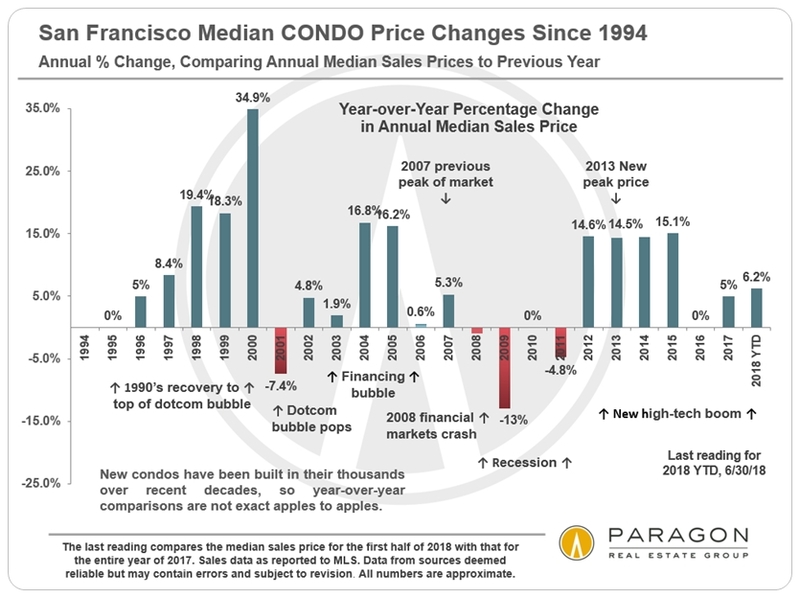 CONDOS: Calculating appreciation rates for SF neighborhood condo prices is an iffier process, because so many large, new condo projects have come on market, significantly impacting inventory and sales prices, and making it much more difficult to perform apples to apples comparisons. Therefore, our calculations, above and below, are performed for the entire city instead of for separate districts. It is certainly true that, due to supply and demand issues, condos have typically appreciated at somewhat lesser rates than houses, which have become the scarce commodity in SF. There has been some variation in condo appreciation rates depending on location, supply and price segment. Home value appreciation in the charts below is broken down by 4 distinct time periods: 1) 2000 to peak of bubble (2006-2008, depending on price segment); 2) peak of bubble to bottom of market (typically 2011); 3) the 1st 4 years of the recovery, 2012 to 2015; and 4) 2015 to present. House appreciation is broken down into 4 broad price segments as exemplified by the markets in 4 city regions: The least expensive segment is represented by house sales in the broad swathe of southern neighborhoods running from Bayview through Portola, Excelsior, Crocker Amazon and Outer Mission (Realtor district 10). The mid-price segment is illustrated by sales in the Sunset & Parkside district (Realtor district 2). The central Noe, Eureka & Cole Valleys district (district 5) is used to represent the expensive segment; and the very expensive house segment is illustrated by the northern, old-prestige neighborhoods running from Sea Cliff, Lake Street & Jordan Park through Pacific & Presidio Heights, Cow Hollow and Marina to Russian, Nob & Telegraph Hills (which are the very affluent parts of 3 different Realtor districts). These areas were used because of their quantity of sales and the relative homogeneity of values within them. For condos, appreciation rates were calculated on the entire SF condo market. The calculations below were made by averaging both median sales price and average dollar per square foot appreciation rates. Present values are based on sales occurring in Q4 2017 and Q1 2018. The first 4 years of the recovery which began in 2012 saw high home-price appreciation rates across the city. In 2015, the market shifted – there was considerable financial market volatility in late 2015 and the first half of 2016, a precipitous drop in IPO activity, and the high-tech boom cooled temporarily – and appreciation rates diverged, with less expensive homes significantly outpacing more expensive neighborhoods. One factor was that buyers were desperately searching for homes they could still afford. By total percentage appreciation since 2000, Sunset/Parkside ranks first. By actual dollar appreciation, the most expensive home prices increased the most, typically by well into seven figures. Generally speaking, the SF condo market has not seen appreciation rates as high as for houses. Mostly, this has to do with increasing supply due to the boom in new condo construction, but it was also affected by factors in 2015-2016 already described above. This chart illustrates the difference in demand by property type. Houses have been the hottest segment in recent years. These analyses were made in good faith with data from sources deemed reliable, but may contain errors and are subject to revision. It is not our intent to convince you of a particular position, but to attempt to provide straightforward data and analysis, so you can make your own informed decisions. Median and average statistics are enormous generalities: There are hundreds of different markets in San Francisco and the Bay Area, each with its own unique dynamics. Median prices and average dollar per square foot values can be and often are affected by other factors besides changes in fair market value. Longer term trends are much more meaningful than short-term. Late-reported MLS activity may change certain statistics such as median sales prices, to some small degree.